My friend Joe Boydston recommended this book to me. I attended one of his running clinics at the Automattic Grand Meetup in Park City, Utah in September. In a short hour, Joe changed the way I approach my training and after applying his tips to my runs, I’ve been given a whole new lease on an activity I’ve been doing off and on for over 20 years. I knew I had to read this book. Born To Run is one part adventure story, one part science, one part anthropology, and one part sheer guts. As an oft-injured runner, McDougall opens the book lamenting another injury. He’s trying to figure out what he’s doing wrong in an activity that’s natural to all humans. Conventional science says that running is guaranteed to tear our bodies down over time with the repetitive pounding, yet by investigating science, history, and anthropology, McDougall discovers that the human body — with it’s upright form maximized for air intake, springy, rubber-band-like tendons geared to storing and returning energy repeatedly over long durations, and our well-muscled buttocks — has evolved into a running machine, dispelling the myth that as runners, we’re slowly ruining our bodies over time. McDougall posits that we get injured because we use high-tech running shoes as a crutch, and that these cushy shoes create more running injuries than they cure. The book talks of the foot as a marvel of evolutionary engineering that we as a society have allowed to let languish in shoes, essentially weakening our foundation, causing supination, and over pronation — the very form problems shoes, braces, and orthotics are meant to cure. Strengthen the foot, and improve your running form, says McDougall. The anthropological study of the evolution of The Running Man is accompanied narratively by stories of The Tarahumara, a race of Indians in the remote Mexican Copper Canyons, who run ultra marathons in the mountains for the fun of it. The culmination of the book is an epic 50-‘mile ultra marathon in the Carrabancas pitting ultra-marathoner extraordinaire Scott Jurek against some eccentric and somewhat crazy American athletes and a group of Tarahumarans — a race arranged by a running-crazed drifter called Caballo Blanco. The pacing of the book is excellent — it’s difficult to put down and it’s a very enjoyable read. 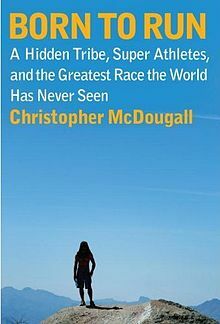 One thing that struck me is that the book opens with McDougall’s running injury, and ends as he completes the Carrabancan ultra. The reader gets occasional advice on the way he revises his form –(easy, light), back straight, head up, knees up, short strides at a cadence of 180 steps per minute — though I would have loved to know more about his personal recovery and how these principles changed his approach to running.